Tony's Di Napoli – Upper East Side. In 2001, Dylan Lauren pioneered the world’s largest confectionery emporium and lifestyle brand. 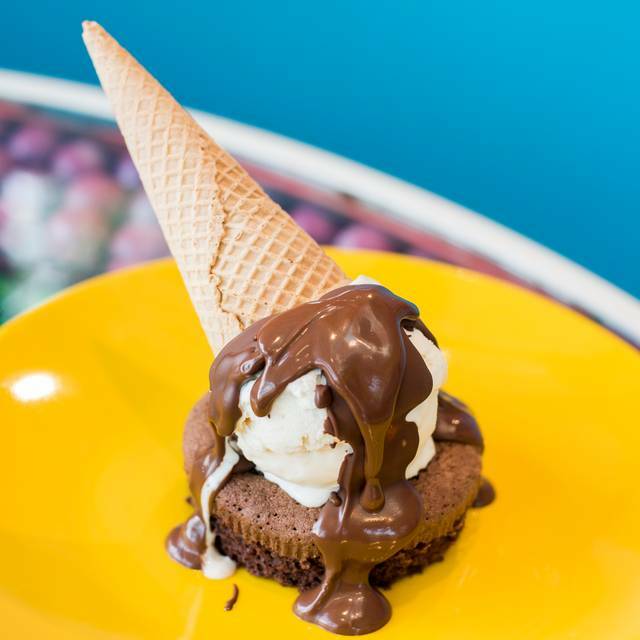 Dylan’s Candy Bar has innovated the way we see candy today - and our cafe is no exception. 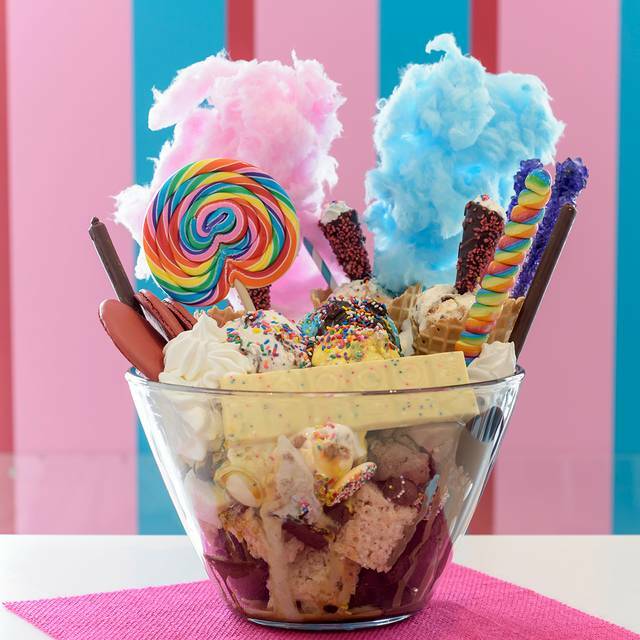 From decadent and delicious sundaes to cool and creative candy cocktails, Dylan's Candy Cafe is the sweetest stop on your trip to NYC. 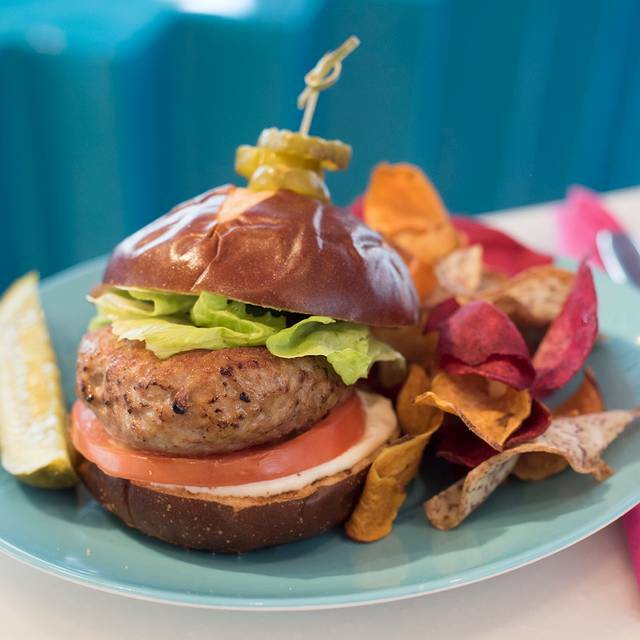 Our full service cafe offers sandwiches, salads, and kid-friendly foods. Stop in during happy hour to try one of our candy cocktail creations. When you make a reservation be sure to inquire about our famous cupcake booths! 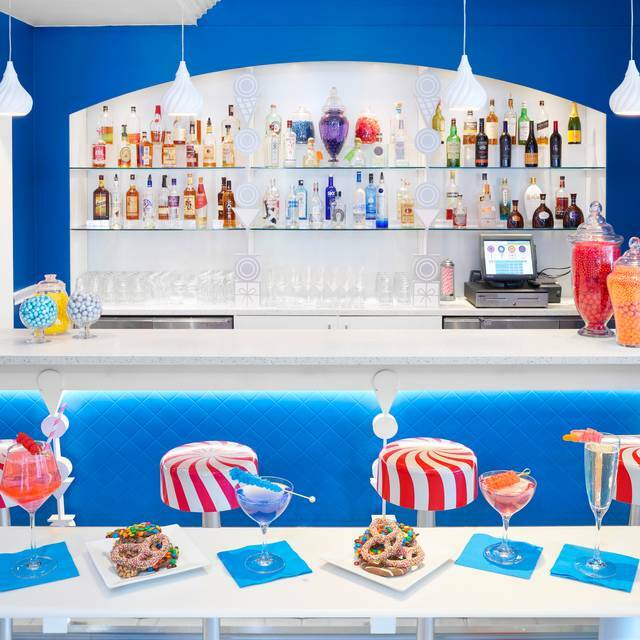 Dylan’s Candy Bar provides the most inviting party in town for the young and the young at heart. 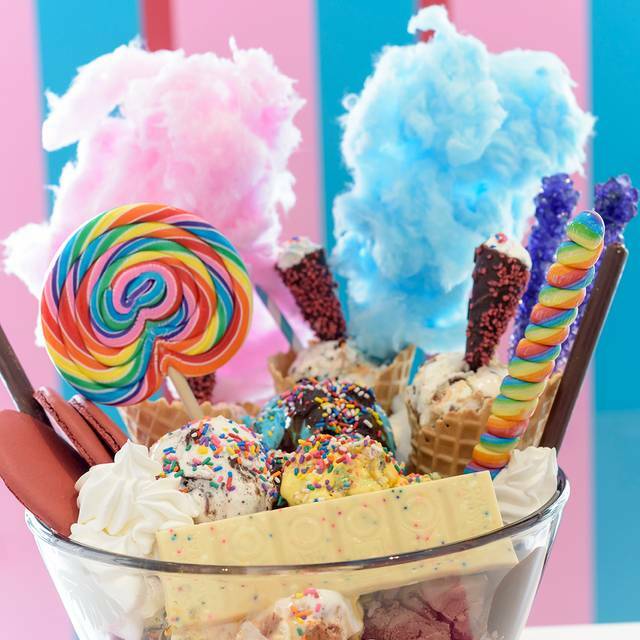 From its colorful party room filled with gumball tables, peppermint stools and lollipop chandeliers to the candy-atized activities provided by its energetic party staff, Dylan’s Candy Bar has it all! We had a fun time but the cafe could use a facelift. The tables were worn and chairs needed a coat of paint. The server was fine but i would have expected her to be a lot friendlier. Food was good. For the price and location a fresh coat of paint and friendlier service would go a long way. It has probably been awile since Dylan Lauren visited. We went to Dylan's for my daughters 11th birthday lunch. The place was dirty, service was terrible and the food was cold. I would not recommend going to Dylan's for any occasion. Great time for my boys. Food was good and desserts were loved by all. We love the Dylans in Los Angeles and didn't realize it was a restaurant in NYC. We had a great time! The café pictures online are very deceiving; you will definitely be shocked to see how small it is in person. We were very excited that we were seated in a cupcake table but the fact that the candy inside the glass top table was broken in pieces, looked old and unappetizing to the eye. Food was okay prices were comparable with other NY eateries. The alcoholic beverages were good but definitely overpriced. We also thought $9.50 for a plain milkshake with no toppings was a bit pricy too considering it was in a mason jar glass. The glasses the drinks were delivered in appeared to be dirty with a film from your dishwasher. And the wait time for our food was a little long considering it was not crowded at the time of our visit. We were shocked to see 20% gratuity added on our check for a party of 4. In our home state that is customary for when there is a large party but never for under a party of 8. 2 out of the 4 bathrooms in the café were out of order and the two that were functioning were very dirty and one had the toilet paper roll laying on the floor. Overall we were very disappointed in our café and visit. It's definitely an experience that we don't have to experience again. They now only serve brunch items and dessert from 11-4 on the weekends and we were not looking for eggs at 2pm which seemed to be the bulk of the menu. The food was ok but nothing great, it is definitely a one and done for us. I’ve been here before and this time I must say I was very disappointed. Firstly, it was my daughter’s birthday and I asked in advance if they could surprise her at the table with a happy birthday song during dessert. They totally forgot and I had to excuse myself from the table to remind them. That’s not the worst part! My daughter asked for a soda and after drinking some we noticed the glass was very dirty with what looked like chocolate on the inside. Then when we got our food (remember we’ve been here before) the same things we ordered on our last visit, it wasn’t what we expected. My daughter had the chicken strips that were over cooked and hard, her onion rings were also cold. I originally wanted a philly cheese steak but they didn’t have any and only told us after we had already placed the order and waited 10 minutes, so I went for the the quesadillas which were poorly put together so everything that belonged on the inside was all over the plate. Overall we were disappointed and don’t think we will be returning to the cafe. The whole experience at Dylan’s was not what I expected. First, I assumed this was a confectioner, not just a retailer. Very little of the candy is Dylan’s. There are Reese’s, m&ms, bubble yum ($2.50 for a $1 package) and some rarer finds. There actually is a strange odor as others eluded too but it’s not a sugar smell, it is a chemical smell, perhaps all the dye in the candy, perhaps something they clean with, I don’t know. But it is noticeable and unpleasant. As far as the restaurant, it is on the top of three stories. It has a different smell, stale grease to me. The restaurant has some issues with cleanliness. We sat at a cupcake table, cool from afar. Up close, the table with dubble bubble gum balls in it had some serious issues. The gum balls are under plexiglass, but there is a noticeable gap between the metal edge frame. That gap is caulked but some of the caulk is missing and some of it is down in a crack and appears nasty. You can also see that drinks have been spilled and water entered the gumball chamber and there were gum balls that had clearly gotten wet. One of them looked like it may have even had mold on it or maybe just part of the candy had eroded off, but it was not a good look either way. The booths could use some fresh paint. The bathrooms were just a bit dingy. Our waitress was subpar, Very melancholy, came by too infrequently despite fact restaurant was mostly empty when we arrived. All of our food seemed slightly overcooked. Dry chicken strips with dark brown batter. A pretzel that was dark brown. A Philly cheesesteak was ok, hot dog was ok. Fries were ok. Shakes were good. Overall what I see is a decent concept poorly managed. I am surprised that in a city with so many options to eat like New York City that this place has managed to survive. We went to the place and the staff was very friendly, then we ordered the food and it was good. The food was great and our server was amazing. We had a great time! Dylan's Candy Bar was such a great experience! We had the Dylan's burger which was delicious! We also had the Poppin' Margarita goblet and it was a good as it looked. Our server was super attentive and kind. I would love to come back! Went to have dinner for my daughter’s 16h birthday. I would say that the overall service was great. The restaurant staff were amazing! The food on the other hand was mediocre, except for the guacamole which was delicious. The decour needs to be updated. The tables/chairs look old and worn out. Me and my family had such a good time & Jalen was our waiter he was a helpful and very kind. Definitely recommend my friends & family to make a visit here. Celebrated a first birthday. The staff were very polite and accommodating! The food was great had the burger, so good! The kids enjoyed their milkshakes. We had a fun-filled evening at Dylan's Candy Bar for my daughter's 16th Birthday! The food was delicious and the desserts and drinks were out of this world! I highly recommend celebrating at The Cafe! We had a 10 pm reservation for 4 at Dylan. We were celebrating our twins' birthday which we noted on our reservation. 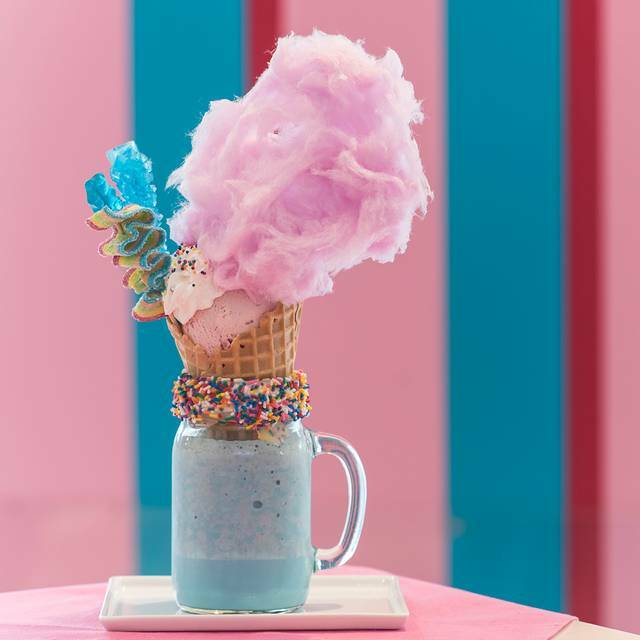 I'll start off by saying, the candy shop on main and lower floors were bright, clean, the atmosphere was energetic, the layout and candy selection was great. My daughter and I arrived at the restaurant 45 minutes early and asked if there were any cancellations in hopes of getting seated earlier. I was advised they were just about to call me to see if I could come in earlier because they were closing early. We arrived at 9:15, when did they plan on calling me to come in early?) Note: I made the reservation 2 weeks ago and I called the day before to see if they had any 930 cancellations to move it up. When we were taken into the dining area, there was only 1 other party of about 8 people who were finishing up and leaving in the dining area and it looked like the staff was already cleaning up to close for the evening. The dining area was dark, felt dirty and lacked any of the energy that was felt on the main floor. We ordered chicken fingers, mac and cheese, and burgers and it took forever for the food to come out ( I don't understand why considering we were the only patrons in the restaurant). The food was average. Between the setting and the food, we had no desire to try the desserts. I lived in NY my whole life and I have always said I wanted to go there but now that I have I don't feel I have missed much. It was such a disappointing experience for me and for my daughter who chose this restaurant. P.S. No mention of us celebrating the kids birthday or even asking if we were celebrating a special occasion. After seeing the other reviews I know we weren't the only ones. Waitress were not that nice! I didn’t feel like welcome. It was my daughter’s Birthday we were so excited to go to this place and it didn’t come out as we planned. They didn’t even sing happy birthday to her. I felt like they were so fast to kick us out. we were never told that. They said it was a communication error between them and open table. Open table then had the nerve to say i missed the reservation! I was there on time as I promised. I cannot say the same for the others! Such a cute place to take your kids. The burgers are fantastic and the desserts are off the charts. Was a real disappointment. They were out of a lot of items in the menu. Place felt dirty inside. Very small. Got nachos and menu said shredded cheddar and mozzarella cheese but was served with ice cold nacho cheese sauce on it. Needless to say we sent it back and told them to take it off the bill. Was served a coffee cup with a huge chip in it and I asked for another coffee cup. 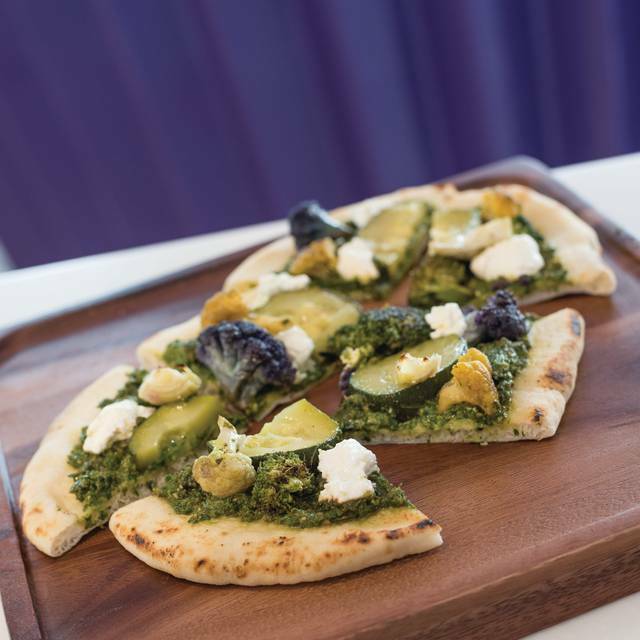 Save your money and chose a different restaurant. The whole store has gone down hill in the past couple of years. My wife and I brought our 2 children along with another couple and their 2 children for a late night desert. The item we wanted, fondu, wasn't on the menu anymore, but our server did get it made for us. The restaurant (top floor) was a total disaster. I worked in the food industry many years ago, and this would not have been acceptable. The bottom floor was great and clean. The music was loud, but ok. The main floor was ok, just ok. The top floor or restaurant area was just plain, nasty. The floors were filthy, the ice cream display was unsanitary looking, and the bath rooms were gross. I must say, I was disappointed. I am a huge fan of Ralph Lauren and love the standard that the company has within their departments and stores. I was completely shocked that Dylan's did not adhere to same standard. The cakes in the ice cream area looked like they had been dropped and the ice cream freezer was just dirty. If I would've came for ice cream and cake, I would have left. Awful. I asked a employee if Dylan ever came by and she said she did from time to time. I would suggest that she either employ someone to pay closer attention or come by herself on a more regular basis. I would not revisit this establishment in the city. In the airport only. The food was great. The service was not the best. I think they were short staffed so I will go back and try again the next time I am in New York. Definitely a dessert place to go and this is what we went for. The desserts are unique and good. My kids enjoyed the place. The service was not that great and we had to wait for 20 minutes (even with a reservation). Terrible Experience. Had reservations to take the kids. We were sat right away, however after 15 minutes, not 1 person came over to our table. I asked the hostess if we perhaps overlooked. She apologized and took our order. We again waited 20 more minutes, and only ordered a sundae. They were not very many people in the eating area, so I’m not sure why they were so slow. Overall, just not worth the hype. The online photos look way better than in person. Not very clean either. This place is SO dirty!!! Came here for dinner with my nieces after Christmas and we were so disappointed. Floors were dirty, bathrooms disgusting, and trash everywhere. Service was so slow and for all that, the food was overpriced. Thought it was a fun place for kids but this was NOT THE CASE! I took my daughter here for her 5th birthday, the day after Christmas. The staff was friendly and very helpful. They made her birthday extra special. Before lunch we toured the store and did a little "sweets" shopping. The food we ordered for lunch was good. The portion sizes were a little more than I expected. 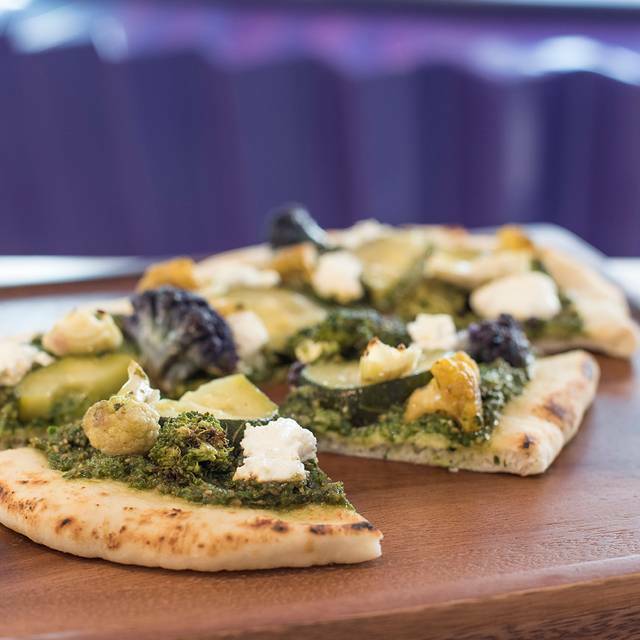 The restaurant appears larger in photos on the website. i was surprised at how small it was, but it was very nice. The waiter was very kind and helpful and paid extra attention to the Birthday Girl. We ate in a giant cupcake at a table filled with gumballs. What 5yo wouldn't love that? They sang happy birthday to her. It was lots of fun. My daughter had a blast. She asked to go back with her cousins. So i guess I'll be making another reservation soon. I’m from L.A and heard I should go. The visit was awful. I waited 20 minuets and then I finally had to talk to the hostess to get a waiter (no water or menu) while waiting . Finally I was able to order. 20 minuets later water came to the table along with our drink order. My daughters drink tasted like vanilla milk with whipped cream. (She asked for a toasted marshmallow ice cream shake). When I mentioned it I was told they ran out of marshmallows. THEN WHY WAS I GIVE A DRINK I DID NOT ASK FOR? Cherry coke float was missing pop rocks that was advertised with it. So I was given a package of grape since they ran out of cherry (in a candy store. Really?) 15 minuets later I received order of tater tots and was told food was on the way. 15 minuets later we had already eaten the tater totes when our food arrived. The burger would have been good if not so greasy and again my daughter did not get what she ordered. She does not eat meat and was given a chicken quesadilla when she asked for cheese. The whole experience took two hours. 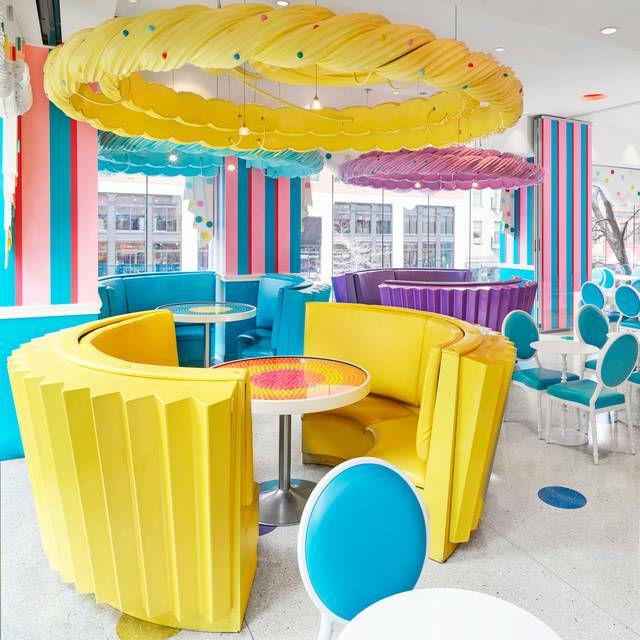 I was really disappointed since I wanted my daughter to enjoy this candy cafe experience. If and when I come back to New York I don’t think I will try again.